Microsoft releases Word Flow Keyboard for iPhone. 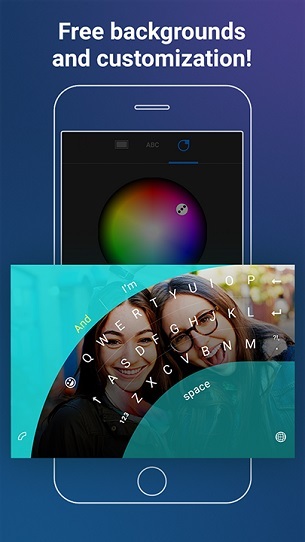 Microsoft has today announced the release of Word Flow Keyboard for iPhone. Word Flow is a blazing fast keyboard with free customization and Arc mode for one-handed typing. Word Flow Keyboard on iOS is optimized for iPhone, and supports English language only. Word Flow for iPhone, a Microsoft Garage project, is a blazing fast keyboard that comes with free customization options and includes Arc mode for easy, ergonomic one-handed typing. + Whether you're tapping or swiping, Word Flow predicts what you're trying to type and corrects mistakes. + Word Flow intelligently suggests the next word in your sentence, and gets better at it over time. + With access to your Contacts, Word Flow predicts the names of your contacts so you can go even faster. + You can customize Word Flow background using one of the images included in the app, or use your own favorite image. + All the images included with the app are free and Microsoft will keep adding new ones. Best for one-handed typing: Switch to Arc mode and easily reach keys on larger screens for a more ergonomic one-handed typing experience.